This special concert brings together three outstanding performers of Indian music and provides an opportunity to hear the shehnai (oboe), an instrument rarely heard in the Indian classical repertoire today. 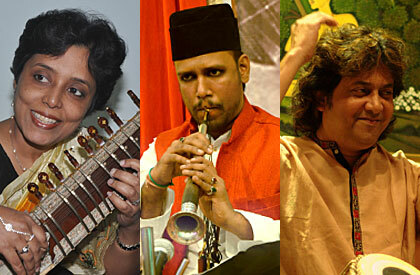 The trio of shehnai, sitar (lute) and tabla (drums) is featured together throughout the concert. Mita Nag, a master of improvisation, represents the sixth generation of sitar players in her family. The daughter and disciple of veteran sitarist Manilal Nag and granddaughter of Gokul Nag, she is an exponent of the Vishnupur gharana (school), which retains the depth, resonance and vitality of the ancient meditative dhrupad style. The brilliant shehnai player Hassan Haider, son and disciple of the famed Ali Ahmed Hussain, has performed and toured internationally with his father and other notable artists. Subhen Chatterjee, a powerful tabla player and disciple of Swapan Chaudhuri, has performed with many of India’s major artists, including Bhimsen Joshi, V. G. Jog and Pandit Jasraj, and created the fusion bands Karma and Friends of Drums (with Sivamani). The first half of the program features ragas opening with alap (unmetered improvisation without tabla); in the second half, the artists perform light classical pieces, including compositions by Girija Devi. The concert is performed in tribute to this late legendary singer.